On May 3, Enviva Partners LP released first quarter 2018 financial results, providing an update of restoration work at the Chesapeake terminal following a recent fire and reporting year-over-year productivity improvements. President Donald Trump hosted a meeting May 8 on the RFS at the White House. During the meeting, attendees agreed to allow year-round sales of E15, to abandon plans to pursue a price cap on RINs, and to allow RINs to be assigned to exported biofuels. The Advanced Biofuel Association has submitted a petition for review with the U.S. Court of Appeals for the D.C. Circuit to sue U.S. EPA Administrator Scott Pruitt, challenging EPA’s process for granting RFS small refinery hardship waivers. Chempolis, Fortum and Numaligarh Revinery Ltd. have formed a joint venture to develop a biorefinery in India that will convert 300,000 tons of bamboo annually into ethanol, furfural, acetic acid and biocoal. Covanta Holding Corp. recently released first quarter 2018 financial results. During an April 26 investor call, the company provided updates of its waste-to-energy projects, including the restart of the Fairfax County, Virginia, plant. On April 26, Neste Corp. released first quarter 2018 financial results, reporting strong results for the company’s Renewable Products division. Overall, the company posted an all-time high quarterly profit. Velocys plc, the renewable fuels company, has received a “notice to proceed” action to commence manufacturing of the Fischer-Tropsch reactors and catalyst for the Red Rock Biofuels LLC biorefinery that will be located in Lakeview, Oregon. Sweetwater Energy and Estonia-based AS Graanul Invest will build a commercial-scale integrated biorefinery that will produce clean cellulosic sugars and highly pure lignin from 50,000 tons of local hardwood each year. A research group from the University of Turku, Finland, has discovered an efficient way for transforming solar energy into the chemical energy of biohydrogen through the photosynthesis of green algae that function as cell factories. The Pasadena Fire Department in California has switched much of its fleet of apparatus from operating on petroleum diesel to using Neste MY Renewable Diesel. Its entire fleet is expected to be fueled with renewable diesel by next year. Renewable Energy Group Inc. launched the company’s latest innovation in diesel fuel, REG Ultra Clean Diesel, at the Advanced Clean Transportation Expo in Long Beach, California, May 2. 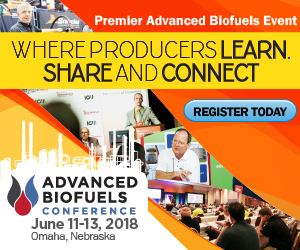 GAIN Clean Fuel and BioResource Development announce the start-up of a renewable natural gas (RNG) production facility located at Water and Resource Recovery Center in Dubuque, Iowa. RNG produced at the facility will be used as transportation fuel. Air Canada announced its Edmonton-San Francisco flight May 2 operated with biofuel onboard a 146-seat Airbus A320-200 aircraft. Air Canada continues to support and advocate for the development of biofuel in Canada. On April 30, Reps. Chellie Pingree, D-Maine, and David Young, R-Iowa, launched a bipartisan House Food Waste Caucus to explore opportunities to reduce food waste. The American Biogas Council spoke at a recent briefing hosted by Pingree. Xebec Adsorption Inc. has announced a strategic partnership with JNK Heaters Co. Ltd. of Korea to advance biogas upgrading and on-site hydrogen generation solutions. JNK will exclusively market the Xebec biogas solutions in Korea and India. The U.S. Department of Energy has announced four funding opportunities totaling up to $78 million to support early-stage bioenergy research and development under the Office of Energy Efficiency and Renewable Energy’s Bioenergy Technologies Office.